Webcam "Weather Webcam Brienz (Brienzersee, Brienzer Rothorn)"
In Brienz, there is the Webcam Weather Brienz (Brienzersee, Brienzer Rothorn) with motif: Brienzer Rothorn Bahn. The webcam Brienz is regularly updated with new pictures. 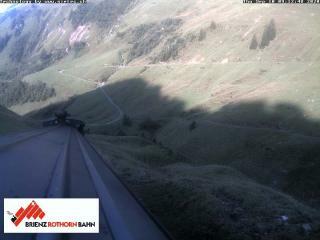 Track the current weather in Brienz Brienzersee with the webcam BRIENZ. The Brienz Rothorn Railway was opened in 1892, but was soon in financial difficulties. Debt included the 1893 opened Schynige Platte Railway opened in 1898 and the Jungfrau Railway and the First World War. Therefore, in 1914 the operation of the Brienz Rothorn Bahn has been set. The train was in September 1916 by the federal government authorization, cancel the railway facilities. Because the railway administration the demolition costs would have had to forward angle, the demolition was omitted despite the wartime material shortages. 1931 dared backer the reopening of the route of the Brienz Rothorn Railway, since the tracks were still in good condition despite the long idle period. Later they made a conscious decision not to electrify the track, which made her a special attraction: The Brienz-Rothorn Railway is now next to the Furka Cogwheel Steam Railway is the only planned circulating steam traction railway in Switzerland. The current live Weather for Brienz is provided by netatmo.